In 2010 after years of wanting a dog my husband finally gave in. I had just beat terminal cancer at the age of 25 and wanted to start a new chapter of my life. We decided on a Miniature Schnauzer after doing lots of research. She was just want we needed. It wasn't long after we got her that we moved into a new house, and I was making curtains for the living room window. Allen my husband and I left to go to my doctors appointment and Inga grabbed the needle and thread off the coffee table for something to chew on. When we got home, we found the string but no needle. In a panic we took her to the vet to be x-rayed and they found the needle in her belly. I was a mess with worry, feeling like a bad Mom. She had to have surgery to remove the needle and was cut open down her little belly. She and I have they same scar now. The doctor told us she would need a little shirt to keep her from licking the staples and I got right to work. I've been making shirts, collars, beds, and blankets ever since. And opened a little etsy shop called PlayfulPup. Just very careful now where I leave my sewing tools. Since then, she has been apart of the Bark for Life through the American Cancer Society with me and we walked as Grand Marshal this year. But shortly after, I was re-diagnosed with cancer. Without Inga being by my side through this I wouldn't have made it. She has been a angel to me. 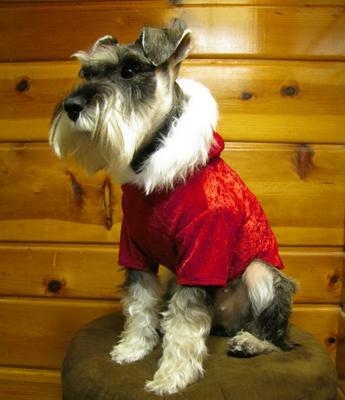 Schnauzers Rule writes: Thank goodness for the little furry miracles in our lives called Miniature Schnauzers. May each new day bring you renewed strength and brighter times. Inga is a very beautiful girl! May God Bless you both with many more years together! 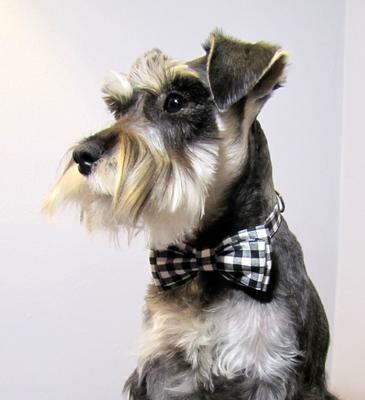 Such a touching story, Schnauzers are truly special and can be so supportive! Loves You Like No Other! Jennifer,I totally appreciate your relationship with sweet Inga. I lost my Father to Parkinson's & my Mother to Dementia & Colon Cancer. I was privileged to be their primary caregiver. After losing my dear parents & the physical/mental stress of being a caregiver,Depression resulted. Medication was prescribed, but it was my precious Schnauzer Sophie that was the ultimate "Therapy", forcing me to get up, get out & get going. She was always there for me. Her endless energy, enthusiasm & loving devotion for me is 100% unconditional and genuine. I assure you, my feelings for Sophie (our "third daughter"!!) are 100% mutual!! Wishing the best for you & Inga & your health! Inga is beautiful. Congrats on the honor!!! What a very sweet story. I hope by now both you and Inga have recovered fully. May God bless you both. 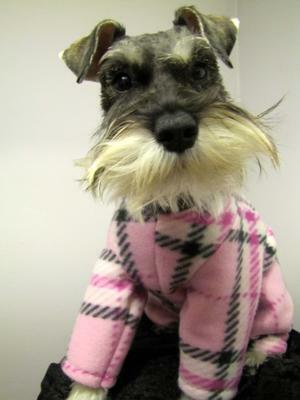 And congratulations to Inga for winning Schnauzer of the Month! Jennifer, I am sooo happy Inga is a part of your life!! You could not have a more loyal, loving friend!! She is gorgeous!!! I pray that you can defeat this cancer once again and continue your shop ... making clothes for our canine families. Love and prayers go out to you!!! !